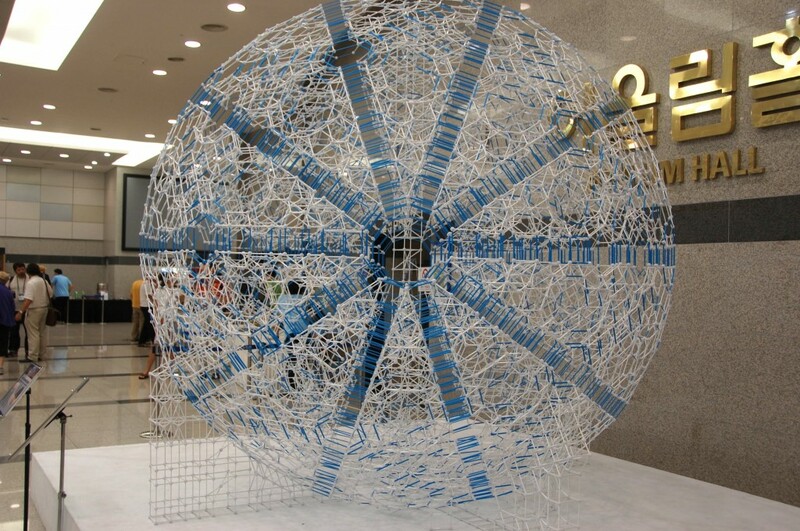 It’s conference season, and I just concluded a week in Korea at the Bridges Math Art conference. This was my third time there, although my previous blogging of it has been minimal. 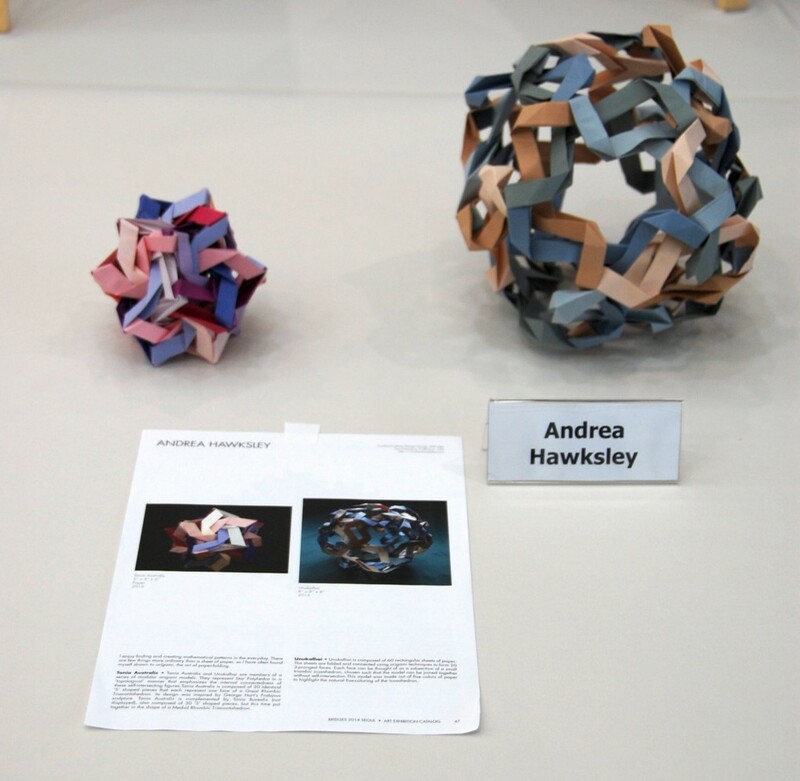 Bridges is *the* conference for people interested in mathematical art, and the diversity of work that is shown and presented there is incredibly impressive. This year I presented a workshop on Binary Dance, which, by participant request, was spontaneously renamed the “Binary Dance Party” to make it more “fun”. I certainly had fun moving around, trading partners, stomping, clapping, and performing assorted binary operations. So much fun, in fact, that I forgot to take pictures. Oops! You can find the full paper on the Bridges archive. I also showed my origami star polyhedra in the juried art exhibit, helped jury the short movie festival (go watch some of these now! ), and acted in the play. By the way, the play, “Scrambled Legs and Bacon”, was a world premiere written by Steve Kennedy and directed by Steve Abbott, both regular Bridges attendees. I played a female graduate student who seemed to spend most of her time solving logic puzzles. As you can already tell just from the things that I personally had a hand in, Bridges really puts an effort into being about all kinds of math, all kinds of art, and all sorts of connections between them. In addition to the events that I’ve mentioned, there was a mathematical poetry night, a math dance performance by Karl Schaffer, Erik Stern, and Saki, and a few large construction “barn raisings”. Given my fondness for the 120-cell, it’s no surprise that I was a fan of this giant Zometool omni-truncated 120-cell that was constructed on site, mostly by some highly motivated high school students. 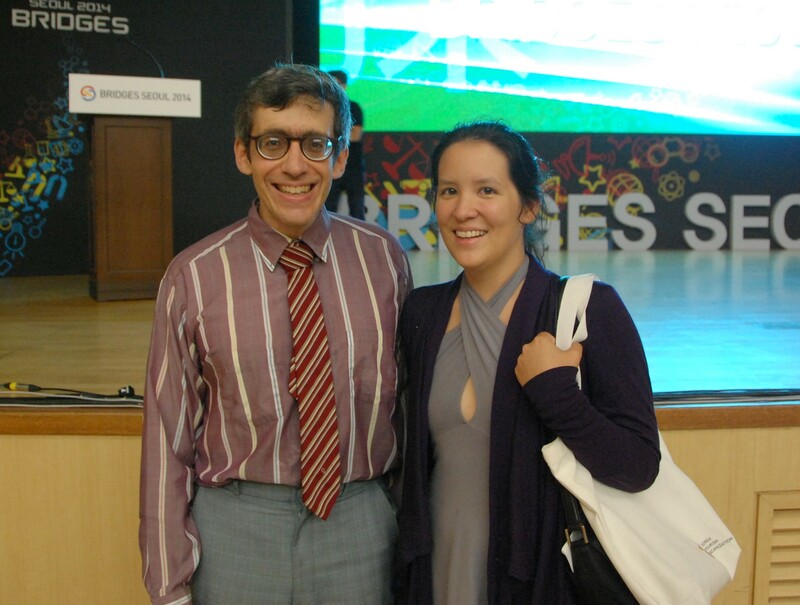 Another highlight of the conference was seeing Noam Elkies and listening to him give his talk on Canons. If you ever get a chance to see Noam Elkies talk about music you absolutely need to go. People were buzzing about his talk for days. 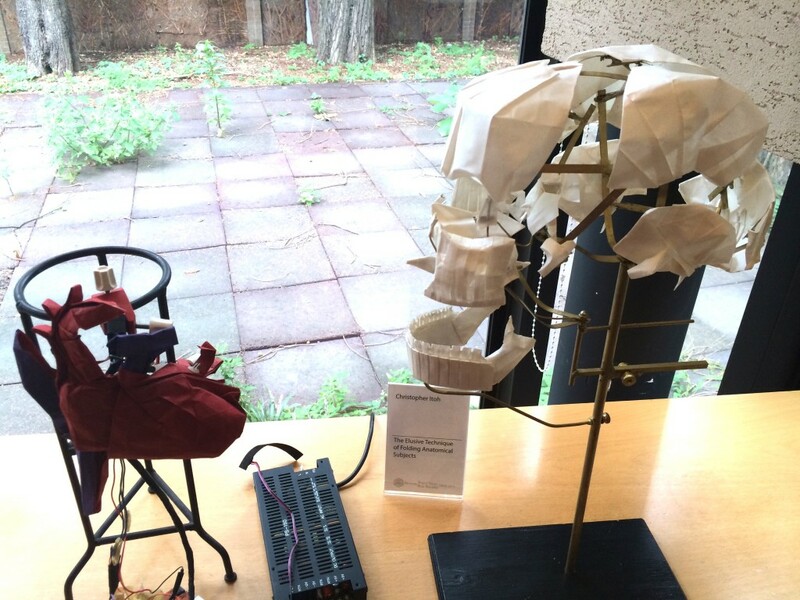 Unlike 6OSME, where the exhibition is supplementary to the accepted papers and presentations, the Bridges exhibition mostly showcases artwork for which there is no presentation (and vice versa). Indeed, at Bridges, the artwork and the papers are juried/refereed separately. However, a few of the talks did match up with pieces in the art exhibition. For example, Carlo Séquin talked about his lego-compatible 3D printed curvy construction pieces and also showed examples of them in the exhibit. 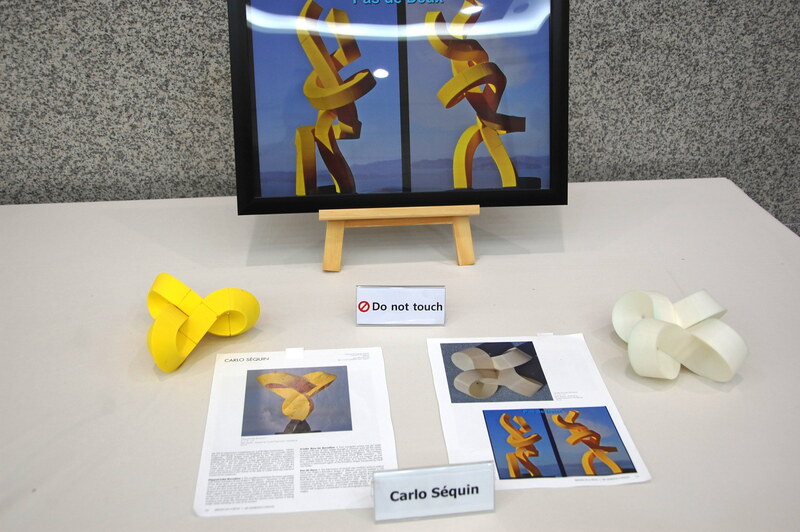 Similarly, Henry Segerman talked about his paper with Vi Hart on creating a physical visualization of the quaternion group, and showed the resulting monkey sculpture in the exhibit. Of course, just like 6OSME, way more awesome things happen at Bridges than I can describe in one blog post. Fortunately, everything is well documented and publicly available, so you easily read the papers, view the art exhibition, and watch the film festival from your computer at home. And, if Bridges seems like your sort of thing, then I look forward to potentially meeting you next year at Bridges 2015 in Baltimore, Maryland. Finally, oh my gosh, tessellating bunny snub cube! 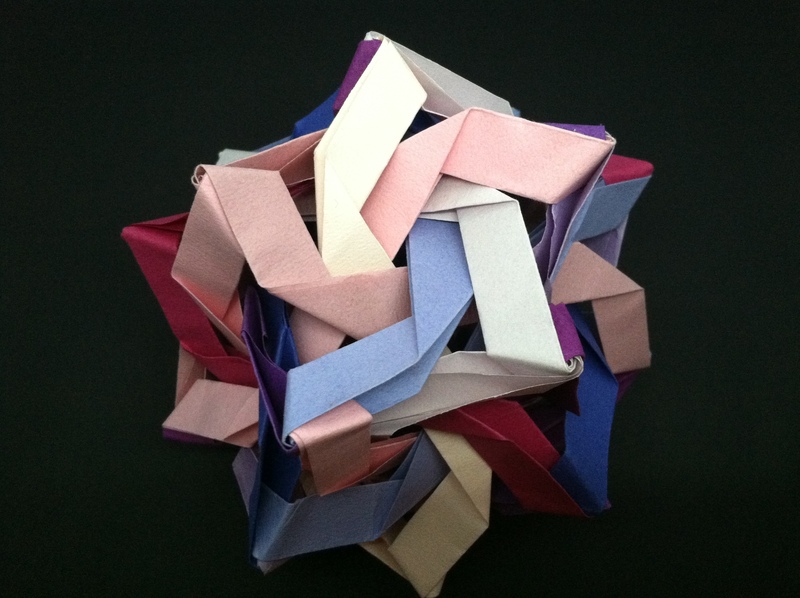 This entry was posted in Life, Math Art, Origami, Recreational Math on August 21, 2014 by hawksley. I spent the last week in Tokyo, Japan attending the 6th meeting on Origami, Science, Math, and Education (6OSME). 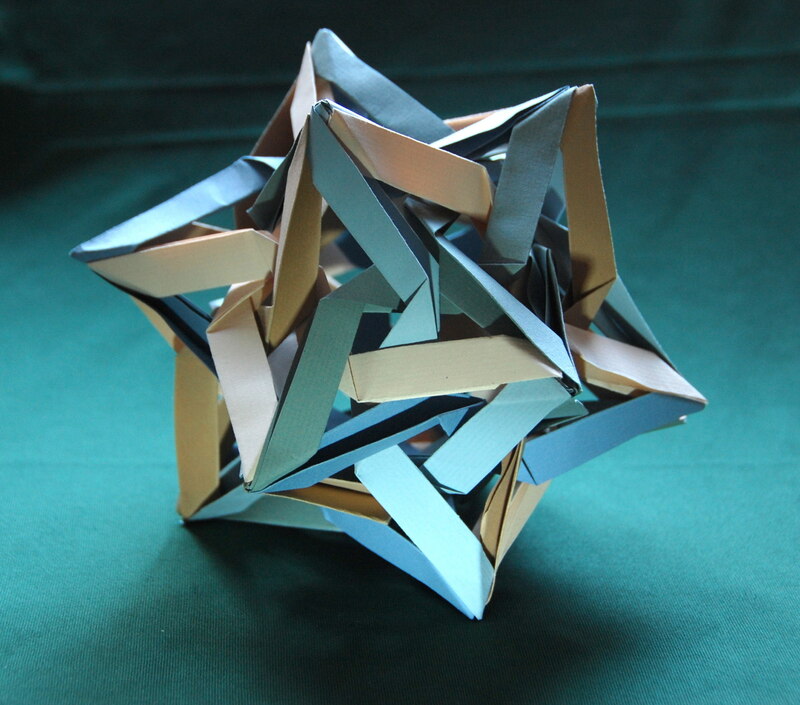 6OSME is an amazing gathering of researchers from all of the many disciplines relating to origami (computer science, mathematics, engineering, architecture, etc. 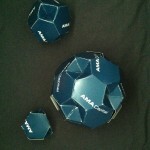 ), as well as serious origami artists. If you’ve ever doubted the validity of origami as a serious research discipline, then hearing a few talks here will surely change your mind. And if you think of origami as paper cranes made from a single folded square with no cuts, then the topics of these presentations might surprise you. 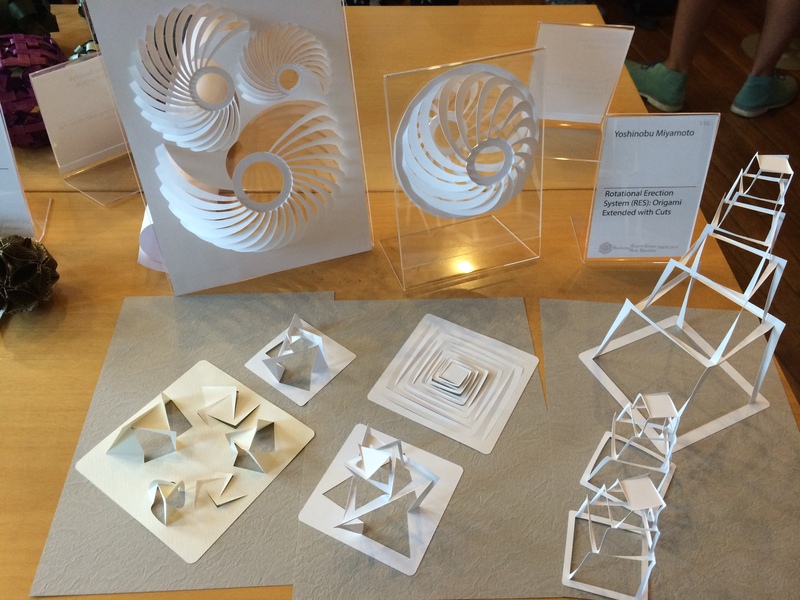 There were way too many presentations for me to cover all of them, but here are a few of the topics that were covered to give you a sense of the breadth of origami research. On the industrial engineering side, Gregory Epps kicked off the convention with a plenary talk on “Industrial Robotic Origami”, or the production of curved, folded metal by robots. Robots folding metal. ’nuff said. Mathematicians like to imagine that the world is made up of “ideal” paper, which is entirely rigid, bends only at fold lines and has no stretch. It’s also infinitely thin, of course. 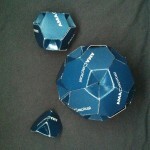 In this theoretical world, it turns out that you cannot squash paper polyhedra flat. You might have trouble achieving this world in practice, though – most paper is actually a bit stretchy. 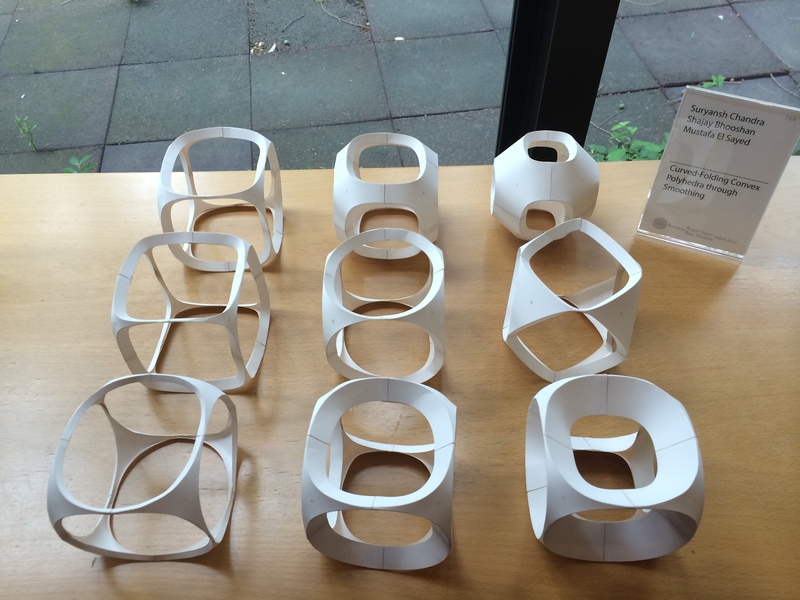 Abel, Connelly, Demaine, Demaine, Hull, Lubiw, and Tachi showed that by adding small slits it is possible to fold polyhedra flat in their work on “Rigid Flattening of Polyhedra with Slits”. Most people don’t think of origami as involving cuts, but 6OSME actually had an entire session devoted to “pop-up” techniques. Yoshinobu Miyamoto showed off some impressively tall and sturdy structures made from single sheets in his presentation on “Rotational erection system (RES): origami extended with cuts”. The tallest one that he demonstrated looked to be about 4 feet tall, and it seemed clear that they could get way bigger with the correct materials. Chris Itoh managed to pull the biological sciences into the conference with his talk on “The elusive technique of folding anatomical subjects”. 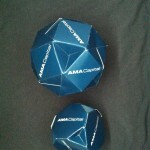 This talk on “Curved-folding convex polyhedra through smoothing” was from a highly architectural point of view. 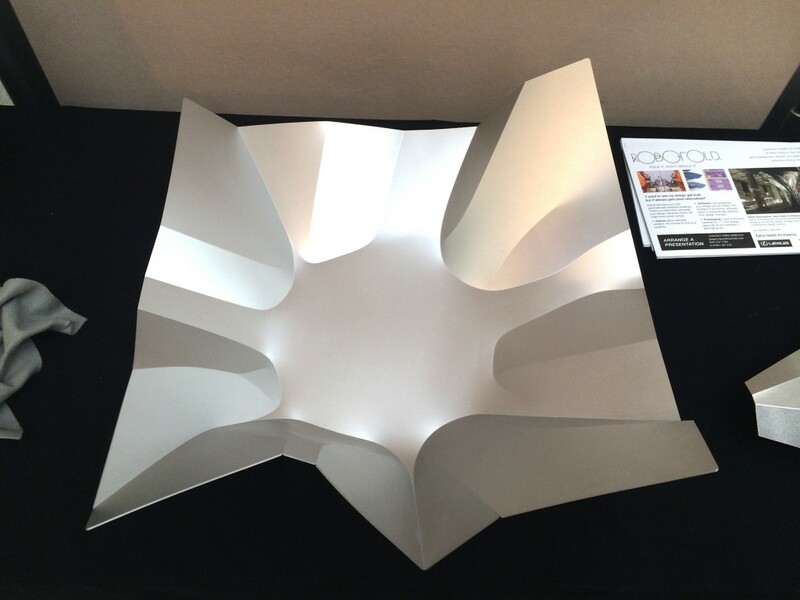 Suryansh Chandra, Shajay Bhooshan, and Mustafa El Sayed work in the research branch of an architectural firm, where they developed this technique so as to be able to create cool, “real-world” structures. 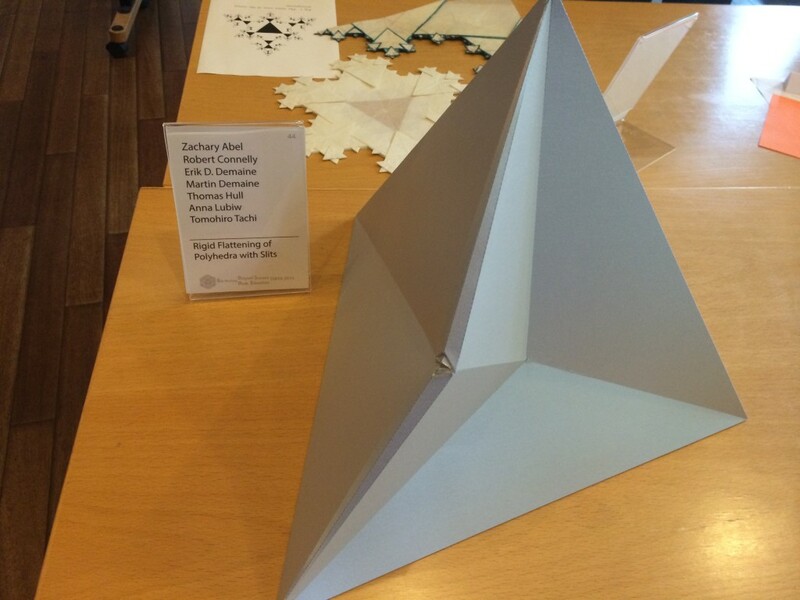 My own work was presented in the “modulars” session on origami made from multiple sheets of paper. 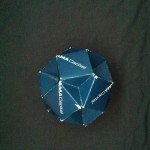 I spoke on my star polyhedra series and the design process that I use to create these highly mathematical models. 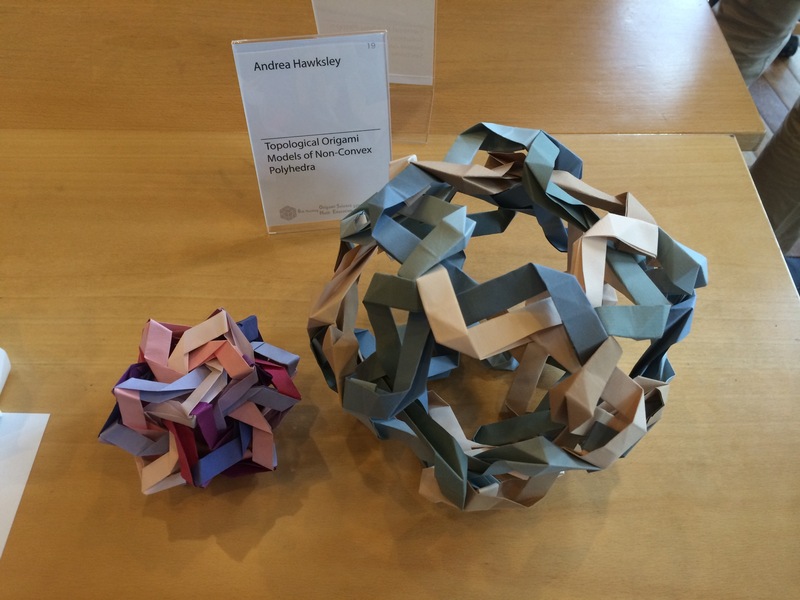 The variety of origami sciences represented at OSME is amazingly impressive, and I don’t have the space to do it justice. I am missing a bunch of fantastic talks just because I was focusing more on breadth than on depth, but I haven’t even covered the full breadth here. You’ll have to check out the full papers (when they come out) to get the scoop. OSME is held only once every four years, so if you want to attend the next one you will have to wait for a while. On the other hand, you’ll have plenty of time to prepare your presentation! This entry was posted in Life, Math Art, Origami, Recreational Math and tagged math art, origami on August 12, 2014 by hawksley. 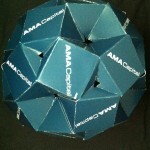 I first posted about an origami model based on a Star Polyhedron in November 2012, but I knew at the time that many more models were possible based off of a similar idea of taking a Star Polyhedron and removing parts of each face such that some underlying topology of the polyhedra was maintained, but the faces no longer intersect. 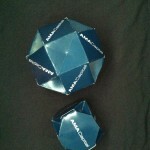 These representation of a star polyhedron can be thought of as ‘topological’ as they emphasize the internal connectedness of these self-intersecting figures. Since then, I have folded some more polyhedra following the same idea, and started naming them after actual stars (seeing as they are “star” polyhedra). 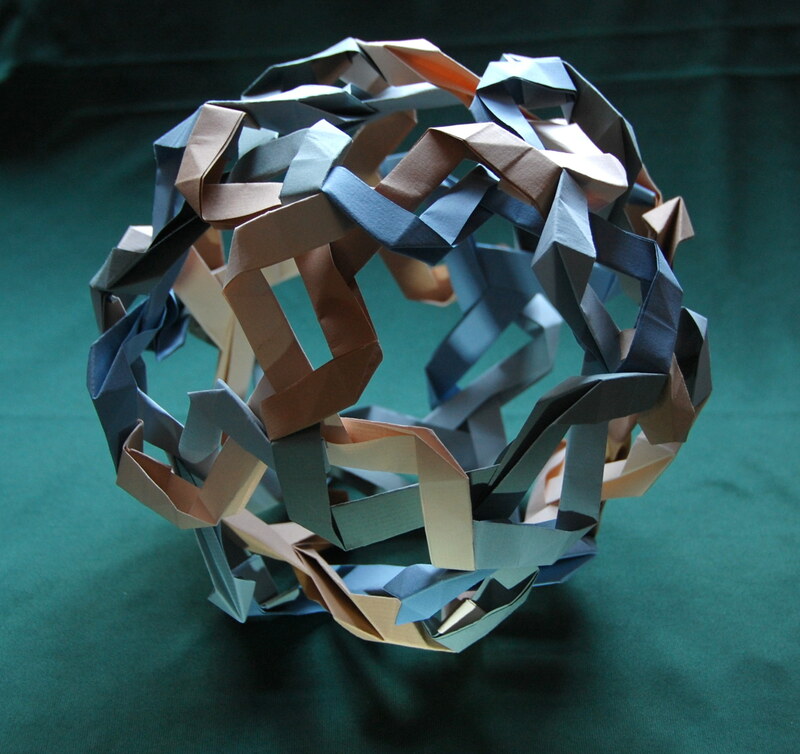 I will presenting on some of the math and design thoughts for this series at the 6th International Meeting on Origami in Science, Mathematics and Education (6OSME) in Tokyo and displaying two of them at Bridges 2014 in Seoul, Korea later this summer. 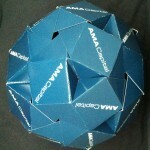 Unukalhai, below, is a ‘topological’ model based on the Small Triambic Icosahedron and is composed of 60 rectangular sheets of paper folded into identical origami units. Each face is represented by a 3-pronged spiral, and can be thought of as a subsection of a small triambic icosahedron, chosen such that the model can be joined together without self-intersection. 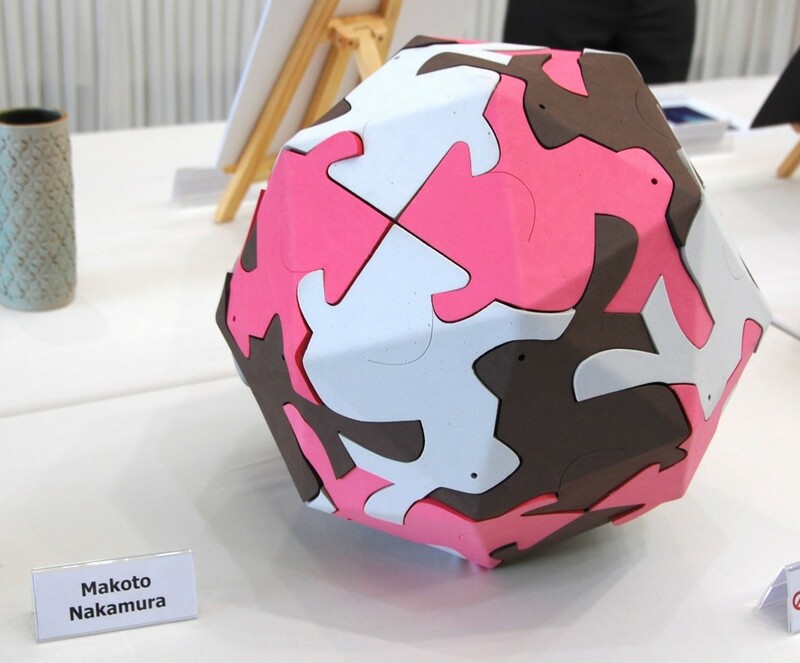 Unukalhai was made out of five colors of paper to highlight the natural five-coloring of the icosahedron. 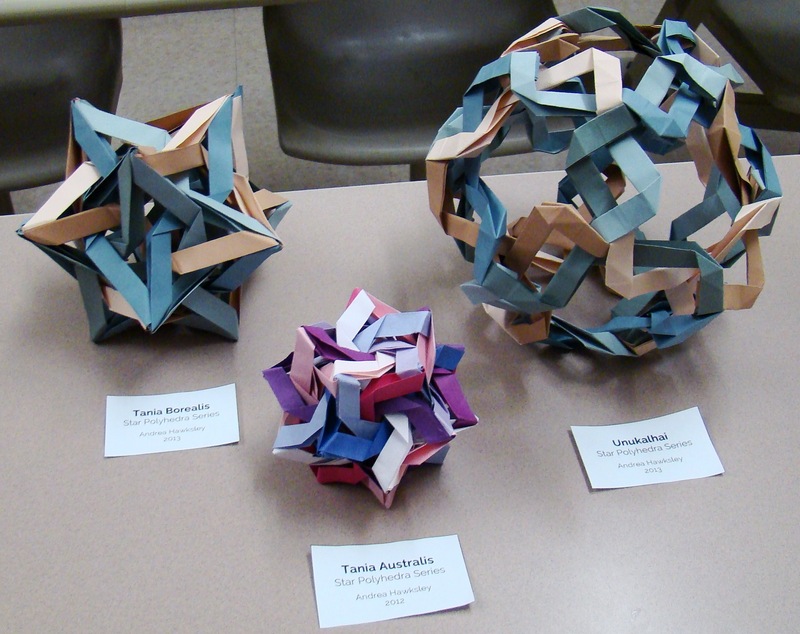 Tania Australis was the first star polyhedra origami piece that I folded, and has been mentioned on this blog before. It is composed of 30 identical ‘S’ shaped pieces that each represent one face of a Great Rhombic Triacontahedron and was inspired by George Hart’s Frabjous sculpture. Tania Borealis is composed of 30 ‘S’ shaped pieces, put together in the shape of a Medial Rhombic Triacontahedron. It complements Tania Australis, but is much more fragile, so I do not plan to put it on display in Asia. 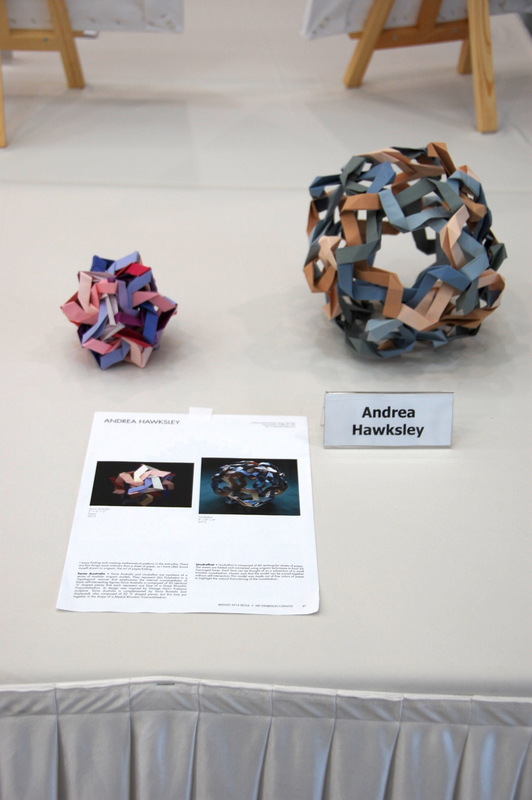 This entry was posted in Life, Math Art, Origami and tagged math art, origami on May 22, 2014 by hawksley. 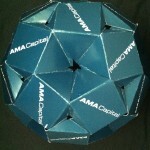 this year had the theme, “Impossible”, so I decided to stay thematic by teaching an “Impossible” origami model. Of course, I didn’t have any such model pre-designed, so my pre-convention challenge was to design a thematic model that could be taught to a mixed level audience in no more than 1 hour. 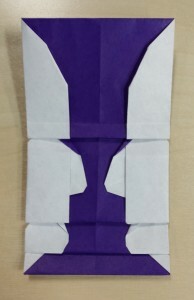 One of my early thoughts was to design an origami version of the impossible triangle illusion, but I quickly decided that that had already “been done” sufficiently. However, this got me to thinking about various illusions and impossible figures. Possibly my favorite classic illusion is the Rubin’s Vase or Face-Vase illusion, so it’s not surprising that I ended up with the Rubin’s Vase as my model. Folded out of gold or silver foil, it resembles a trophy cup, hence my final name for the model, the “Rubin’s Trophy Cup”. When folding out of foil, it is also possible to add some nice rounding to the cup. Other exciting notes from EBOC 2013, include having my fox finger puppet model published in the convention book (the very first time I have ever published origami diagrams), meeting Janessa Munt, and having my non-origamist boyfriend win the scavenger hunt challenge. This entry was posted in Life, Math Art, Origami and tagged math art, origami on December 13, 2013 by hawksley.